With Thanksgiving a week away, I’m sure many of my Canadian friends are already in menu planning mode trying to get ahead of the rush at the grocery story. I know I am! As one of the biggest, if not the absolute biggest food holiday, I’ve seen so many incredible dishes peppering my feed on Pinterest, Instagram and Facebook. I’m sure yours has been too. So I thought it would be fun to do our first recipe round-up and share some favourite holiday dishes with all of my readers. I would love to hear what your favourites are in the comments below. I know you guys are going to be poking around the internet, searching out the recipes for your yummiest Thanksgiving ever, so I’ll share some of our favourites, new and old, to help make your holiday amazing! From Turkey, to maple glazed baked ham I pinned some mouth-watering dishes you are sure to enjoy. Plus, there are a few recipes that you can even make ahead to free up time and much needed space in your oven. 1.sage onion and smoked bacon stuffing: smoked bacon, olive oil and freshly chopped herbs give this filling stuffing a rich, hearty flavour. 2.Homemade Turkey Gravy: I mean let’s be honest…homemade gravy is the best thing ever invented. 3. pumpkin caramel cream cheese poke cake:The ultimate fall dessert! A pumpkin spice cake drizzled with caramel sauce, frosted with a fluffy cream cheese frosting and topped with even more caramel sauce! You’ll love every single morsel of this uber moist, delicious cake! You can check out each of these recipes and where I found them below. 4.apple cranberry walnut salad:Crisp apples, dried cranberries, feta cheese, and hearty walnuts come together in a fresh Autumn salad. An easy side dish for any favourite meal! 7.Best Roast Turkey: it just wouldn’t be a celebration without turkey!! 8.slow cooker creamed corn:Skipped the canned cream corn this year and make it from scratch right in the crock pot – it’s so rich and creamy and unbelievably easy to make with just 5 ingredients! 9. Mini Pumpkin Pies:Mini pumpkin pies! Rather than overwhelming yourself and your guests with too much of a good thing, let them enjoy a bite sized treat. There’s always room for something mini! 10.crock pot maple brown sugar ham:I love ham, and always looked forward getting to enjoy turkey AND ham in one meal. 11.garlic and chives mashed potatoes: Our new go-to recipe for mashed potatoes. 12. cranberry salad recipe: a new twist on an old family favourite..fresh oranges and pineapple in place of canned and stubbing dried cherries for maraschino. 13.pan sauteed brussels sprouts caramelized onions bacon:An easy healthy side dish perfect for the holidays. 14.honey maple roasted carrots: Thanksgiving without carrots just doesn’t exists! 15.Leaf Cookies: a perfect take away from a great family event! What are you serving your friends and family this holiday season? Do you have a signature dish that is a must make? Great ideas for people that do the same boring dishes every year! I don’t eat meat, but I always make the traditional potato and stuffing dishes. Great list! All of these recipes sound amazing. I especially want to try that stuffing. You had me at bacon! I can’t wait for all the delicious food! Making room in my fridge for the leftovers already hehe! I am so excited for Thanksgiving and all the delicious food. I lvoe everything about Thanksgiving from side dishes to pies. So mcuh yummy. Every year my family makes the same things. Tradition right? However I feel we need to start adding some new exciting things. I am going to add the apple cranberry walnut salad from your list! Thank you! I would like to try sage onion and smoked bacon stuffing:. Also, .crock pot maple brown sugar ham seems perfect for my holiday gathering. i cannot believe Thanksgiving is next month! These recipes all sound mouth watering! 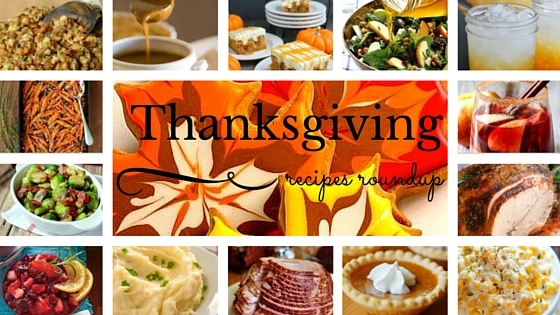 These sound like great recipes to twist up a Thanksgiving menu. The cranberry salad would be really yummy, I bet. Thanks for including my Candy Corn Punch!! This is such a fun roundup! Yum! So many great dishes!! I love this time of the year. Time to start planning thanksgiving dinner! I can’t get enough pumpkin right now. Thanks for a great recipe roundup! Since I’m Caribbean I tend to do a bit more Caribbean dishes for the family for thanksgiving. My husband used to do the turkey since he’s American but our Thanksgiving is always amazing. A lot of these sound good. The honey roasted maple carrots though??? That’s the one that gets to me. I’d love to try them. Thanks for the great round-up of dishes. I usually make the standard dishes, but I see a few recipes on here that I may have to try. Set a few more places – we’re coming for dinner! Everything sounds amazing! Oh I’d love to include some of these in our Thanksgiving dinner. Those carrots are jumping out at me. Wow – these are some great ideas! I’m always looking to add new flavors to our celebrations and I’ll be trying out quite a few of these ideas! I hate to think that it’s time to plan for Thanksgiving, but I guess it will be here before we know it. I’m pinning your recipes — they all look so good! I think mashed potatoes make everything better! The candy corn punch is so awesome! In my house, my kids would love that best. My husband loves stuffing best. That applecrisp sangria sounds wonderful! People always look forward to our apple cider glazed ham! Those all look fantastic! The Candy Corn punch looks like a fun drink and a must to make! I host Thanksgiving every year and I am totally making that honeycrisp apple sangria this year for my guests. I am trying those mini pumpkin pies. You have inspired me for Thanksgiving and I know here in the states it’s October – but yum!